a pet stop along the Silver Comet Trail in Paulding Co., Georgia. 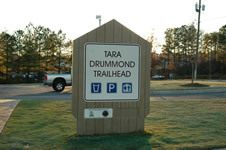 The Park is proposed at a new trailhead on Hwy278 approximately ½ mile West of The Paulding County Chamber of Commerce, at The Green Bridge. The International Association of Law Enforcement Firearms Instructors (IALEFI) held a Pistol Match fundraiser at the annual conference in West Palm Beach, FL in June and raised $1,200. Thank you so much from our hearts. Pictures and other will be added soon. Check out the follow-up newsletter from IALEFI. 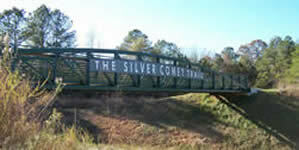 Spring Golf Tournaments have been held in 2006 & 2007. Both were huge successes; approximately $30,000 was raised between the two events; pictures and sponsor notes are available HERE. The SlowPitch Softball Tournament was a blast. Almost $3,000 was raised. The Teams were exciting and everyone maintained a very high level of sportsmanship. Park area Dedication Benches are available. The type and style of available benches have been set to match the Silver Comet Trail's existing design to remain consistent with the Trail. Details are posted on HERE. Many, many, many individuals and businesses have made direct donations to support Park construction and completion.